Vintage: 56.7% of responses. I'm not at all surprised by this. Due to the fact that vintage cards continue to be difficult to find in top shape, graded copies command higher premiums each year. This is especially the case with registry collectors. High grade commons can fetch serious money with guys looking to complete their registry sets. That aside, however, vintage cards possess a certain intrigue that sets itself apart from cards in other categories. The sets, the players, even the conditions of some of these cards all tell stories. It's fun to think about what happened to the card that's been ripped in half and taped back together. Or the card with the pin hole through it. In a way, cards in this category are each historical anecdotes. This era also possessed some of baseball's most beloved players. From Cap Anson to Ty Cobb to Mickey Mantle to Nolan Ryan, George Brett and Ozzie Smith, this era features some of the guys that popularized the sport and help make it what it is today. These are just some of the reasons I believe for why the vintage category drives consistent hobby interest. I also believe the demand for vintage will continue to be the primary focus for investment collectors for years to come and as more decades fall into this category. Modern prospects: 20% of responses. In terms of investment potential, this has always been a much riskier avenue to walk for collectors. The hope for a guy to pan out to enough of a degree that their cards will garner significantly higher premiums down the line has always been of interest to a lot of collectors. Some guys pan out, some don't but the gamble is what makes this such an interesting category. Even for guys that carefully study player matrix, it can be difficult to predict the outcome of a player's complete career. In a way, you just have to wait and see. A lot of factors need to play in with one another in order for a player to have a stellar year, much less an entire career. Each year, hype is generated around one or a small number of particular prospects, which makes for an interesting and sometimes even entertaining hobby landscape. Sometimes, especially with pitchers and catchers, investment risk can be quite a bit higher. With common associated injuries such as Tommy John surgery and knee problems, prospects holding either of these positions can possess much higher risk than those filling other roles. No matter the position, however, collectors continue to possess interest in prospects each year. Prospecting can be incredibly interesting, especially for collectors with a strong interest in statistics. Signed and/or Memorabilia Cards: 15% of responses. This one surprised me. Signed and memorabilia cards are so abundant that they routinely go unsold in bargain bins at shops and shows across the country year in and year out. And still, companies keep cranking them out with what seems like every single product released each year. It feels more these days like the so called, "Hits" only seem to reveal autographs or relics. I've had several conversations with esteemed collectors over the years and one thing that seems to be consistent is the ho-hum nature of interest in cards in this category. There are exceptions, however. For example, anything in this category from the 1990s is considered highly desirable regardless of player. The reason being is odds for acquisition were often 1:thousands of packs. No guarantee equates to each acquisition being of significant interest equates to each card featuring big time talent almost always. These days, cards in this category are guaranteed in almost every box or pack and the players featured may or may not be of interest to anyone. Hence, the ROI can oftentimes be demoralizing. Other: 5% of responses. Since this category isn't clearly defined, there's no way to converse about the intricacies of these results. 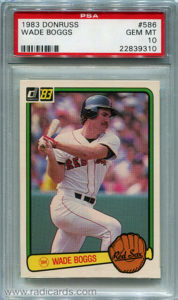 While cards from the 1990s are of notable importance to the hobby, I'd imagine the number of collectors that follows this decade carefully is relatively small in comparison to that which follows a much broader scoped group of cards such as those found in the Vintage category. Didn't get a chance to complete the survey? Share your thoughts on what you think is the best long-term investment in the comments area.